Throughout 2012, I'll be sharing personal stories about myself on Sundays as part of this Blissfully Series. I shared the first post last Sunday (click to continue), and another one should magically appear next Sunday. My life has already had its share of good moments and bad moments, and these are the ones I consider the most important to my life. 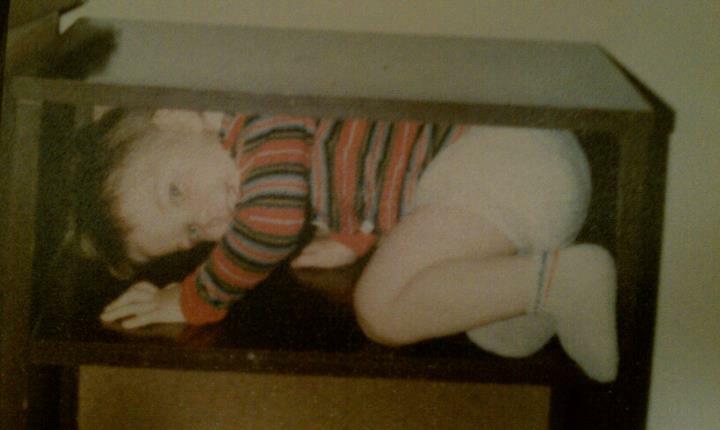 As a boy, I loved curling up in tight spaces. My first baby-sitter was my Aunt Sherlene. She's one of the nicer people I've ever met, so I know I got off to a good start. However, I was so young when she watched me that the memories I do have come without audio and are like two-second blips of footage and emotions. Outside of family, there are four main baby-sitters who I remember the best. I'm not sure what process (if any) that my parents used to select sitters. As a kid, they often felt kind of random. But when you're a kid, there's the world of adults and the world of kids. First of all, I'm not giving nicknames to each of my baby-sitters to be mean. And I'm not doing it to protect their identities. The simple fact of the matter is that I don't know who any of these baby-sitters are. These people who watched me through the day were all strangers outside of when they watched us. So the first sitters I can remember were Mr. and Mrs. Shady. I may have distorted them over the years, but I always think of the Mr. Shady as kind of like Tom Petty with a moustache and Mrs. Shady as a female Tom Petty (without the moustache). I remember having to take naps on their floor and eating (yes, eating) strings out of their carpet. (By the way, one of my earlier memories was eating ants outside on the back patio of our little house in Fairborn.) My appetite for thread may have been prompted by what they always made us eat: mushroom soup. Seriously, that's all I remember these people ever feeding us. Mushroom soup or nothing. Except, we did go to a hospital or doctor's office once, and they gave us some Combos (pretzels and processed cheese-tasting product). Mmmmm.... To this day, I still can't stand to eat anything with mushrooms in it. The lady down the street was the mother to a "friend" of ours in the neighborhood. Of course, the kid wasn't really a friend of ours. He was a troublemaker through and through, and I wouldn't be surprised if he joined a gang when he got to high school (we moved out of Fairborn when I was in the 7th grade). This woman wasn't really a waitress, but she looked like one of those middle-aged women you might find in a diner who has a permanent scowl on her face. When she did smile, it was the forced kind that was seeking a tip. Her own children were young, and she took in more than just me and my brothers. I'm probably being unfair to The Waitress, but she always sided with her own children, and I remember my brothers and I hating her for her favoritism. But I do remember she lived close enough to our elementary school that we would walk there after school when both my parents had jobs. This woman was not really our grandma--or a relative of any kind--but she was old and smoked like a carton of cigarettes every couple days. She watched us one summer, and I remember splashing around in her pool--one of those little, hard plastic ones--and playing endless games of Yahtzee by myself while watching videos on MTV. She was nice enough, but all I remember of her were the cigarettes. Now, there are a ton of childcare institutions and pre-schools. While those existed when I was a kid, baby-sitters were the norm--and were really the only affordable option for my parents. After spending days with these people, you might think I'd have better memories of them, but they were truly strangers who let us run through their houses and play with their kids. There are times when I wonder if baby-sitters are a good or bad thing. In one sense, it opened me up to new people and gave me perspective on my own home. If I was watched at a childcare institution, I wouldn't have been able to compare one house to another. But for better or worse, these were the strangers who watched me and helped shape me. Poetic Saturdays: Until Further Notice. It's funny what we remember. Eating carpet strings and playing Yahtzee by yourself... no wonder you liked to hide in small places. very nice blog. I will surely be back to read more good posts..